Although Richard John thought that he would have obtained 14 grade one passes, the Argyle resident was more than happy with the exceptional CSEC results he did receive. In an interview with SEARCHLIGHT on Wednesday, the recent graduate of the St Vincent Grammar School expressed how relieved he was to have achieved such good grades. âI think I was really relieved that I finally got my results and I got the grades that I really wanted,â John said. John obtained grade one passes in Biology, Chemistry, Physics, Math, English A, English B, Geography, History, Information Technology, Electronic Document Preparation and Management, French, Spanish and Principles of Business. For Music, he obtained a grade two pass. The 16-year-old revealed the key to his success, explaining that he began preparing for his exams approximately three months before. He also dished out some words of advice for students sitting the exams in the future. âDonât underestimate your subjects. They might seem easy and sound easy at first. You need to place all your efforts into all your subjects equally in order to achieve top grades,â John said. Among the list of persons that the teenager wished to thank for his success were his parents and teachers, particularly English teacher Isha Frederick. âShe really inspired me to excel in my subjects and she gave me a lot of support over the years,â John said about his teacher. Both of Johnâs parents are also teachers. His mother, Cheryl, told SEARCHLIGHT that she was extremely proud of her son. The elated mother noted that she felt like being a teacher has helped her son, particularly in his formative years, as she and her husband were able give him a lot of support and ensure that his environment was conducive to learning. 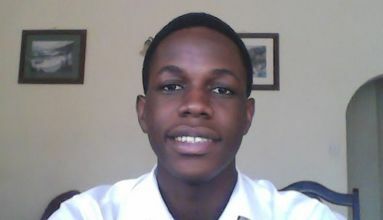 John began his primary education at the Argyle Primary School and later transferred to the Kingstown Preparatory School, where he excelled in the Common Entrance Examinations in 2009, placing first for boys and first overall.